Greta Thunberg’s resilient climate activism has inspired a growing movement. Greta Thunberg, from Sweden, is sitting out of school on Fridays until climate change is a globally mobilised priority. 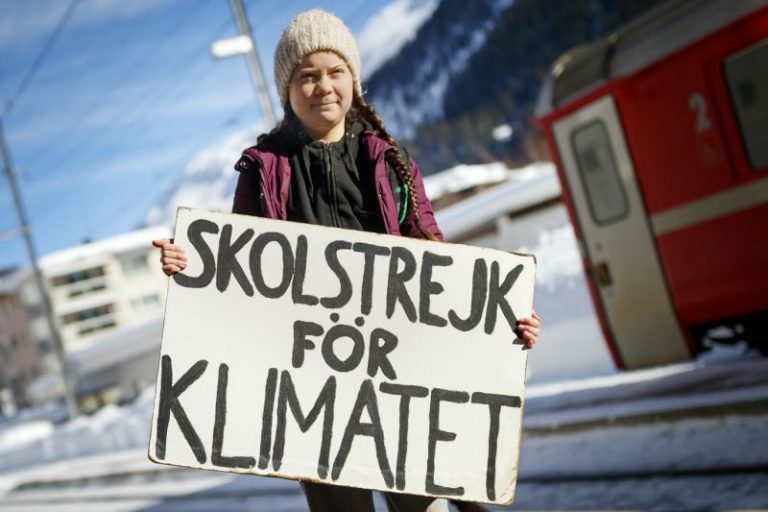 Her simple action of sitting with a sign stating “school strike for climate” outside the Swedish parliament building in Stockholm led to her being invited to talk at the UN COP24, where she further called out global leaders for their inaction: “You are not mature enough to tell it like it is. Even that burden you leave to your children. You have ignored us in the past, and you will ignore us again. You say you love your children above all else, and yet you are stealing their future in front of their very eyes”. She is fierce in her response to critics: “We must hold the older generations accountable for the mess they have created.. and say to them that you cannot continue risking our future like this”, and encourages other students to channel their anger into activism: “Why should any young person be made to study for a future when no one is doing enough to save that future?” Her words and actions have inspired other students globally to support to this growing movement, particularly in Australia; activism, which Greta Thunberg supports, “on Fridays”, “at school” or “wherever you feel called”. Inside schools too, there is also a movement towards skilling up to find solutions, with many international schools beginning to become technical schools, incorporating makerspaces, green tech innovation and entrepeneurial hubs, but such schools are prohibitively expensive for the majority of people, and can be elitist. Of all education, science education (and, with this, opportunities and networks) can be particularly locked up in privileged towers. Systems and cycles, attitudes and expectations keep this so. We cannot create a wave of systematic, long-term and sustainable change by going about things as we always do. Green innovation – the skills, the opportunities – need to be available to all youth. We need to open source all education at every level and digitise as much of this as possible. We need to ensure everyone has access to free, strong WiFi and all levels of education really should just be “common knowledge”. At the moment, under Capitalism and other various Patriarchies, privileged people have greater access to learn knowledge, and then they don’t have the generosity or incentive to pass that on and share it freely, rather enjoying a privileged position in society just by holding their knowledge, and profiting from selling that knowledge, as consultants. This isn’t the way education should work! Education should help enrich society as a whole! Education should be something communal and shared, so that more ideas can spark and flourish, and anyone having the privilege of education should be willing to share that freely, as well as using it for other societal good. As Girls in Science, we are aiming to make girls in science the norm, and striving for and achieving the SDGs the expectation. Across the world, teachers too are supporting their students by already striving to mobilise their classrooms to support the SDGs in exactly this way, for example Teach SDGs and the World’s Largest Lesson, and students are learning the interconnectedness of the SDGs, that they are all part of one larger vision of long-term sustainable change. One thing is for certain, in school or on strike, at a conventional school, alternative school, democratic school, or homeschooled, we youth need to continue to mobilise and communicate, and this platform is there to help us do exactly that. Please share your thoughts and comments here and on all the other articles, and write your own too! The more we share our voices and ideas, the more chance we have of creating movement on these prescient issues, and finding the best solutions!